Australia’s Todd Sinnott secured a top-10 finish in a main US amateur event finishing in a tie for 9th position at The Players Amateur at Hilton Head in South Carolina. American Corbin Mills won the tournament to secure his second main amateur title with a wire-to-wire effort after opening with a 67 to follow with rounds of 69-68-72 for a 12-under-par finish and a stroke victory over Curtis Thompson and Patrick Rodgers. Mills, 21 from Anderson in South Carolina, won the US Amateur Public Links title at Bandon Dunes last week on the first extra hole over Derek Ernst. The dual wins has moved Mills inside the world’s top-50 as he continues one of the hottest winning streaks this season in the US. It was the second top-20 finish for Sinnott after a solid opening US tour campaign last week in Atlanta where the Victorian finished in a tie for 19th position at the Dogwood Invitational. This is Sinnott’s first US tour and the Victorian is settling in quickly and recording results. The 2009 Victorian Boys Champion fired rounds of 69-71-72-69 to finish at 7-under-par at The PLayers to be the best of the Australians. “I was happy with the way I came back from my starts,” said Sinnott. For Australia’s Kalem Richardson, this was one tournament that got away. The Tasmanian started the final day in second position three strokes behind Mills after opening rounds of 68-69-70, but bogeys over four of the last five holes damaged his chances of claiming a major amateur title in the US as Richardson carded a 3-over-par, 75. 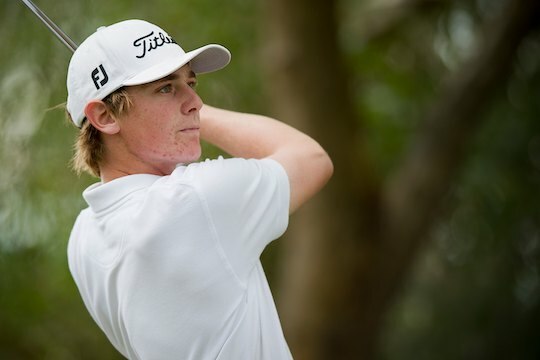 Cameron Smith secured a top-20 result with rounds of 69-72-72-71 to finish in a tie for 18th position, which will give the 2011 Australian Amateur Stroke champion plenty of confidence moving into the US Junior Amateur championship on 17th July at Gold Mountain Golf Club in Bremerton. Nathan Holman fired an impressive final round 5-under-par, 67, with the 2011 Riversdale Cup champion moving up the leader board to finish in a tie at 22nd position following earlier rounds of 71-75-73. Matt Stieger and Ryan McCarthy finished in a tie for 31st position with Stieger firing rounds of 70-75-73-71 and McCarthy having rounds of 71-72-71-75. Brett Drewitt closed out the Australian contingent with rounds of 74-71-75-71 to finish in a tie for 39th position. Tim Hart and Tarquin MacManus missed the cut with MacManus firing rounds of 82-69-77 and Hart recording rounds of 74-77-76.